Sometimes the most influential women in people’s lives were born non-indigenous, but were married-in and adopted into Aboriginal families. They became an integral part of community, and helped their children and grandchildren develop strong and proud Aboriginal identities. Our last NAIDOC 2018 Because of Her, We Can story talks about one of these women, Morag. Her daughter Anne-Marie Johnson, is a strong, determined, loving and spiritual Gooreng Gooreng woman from Gladstone, QLD. 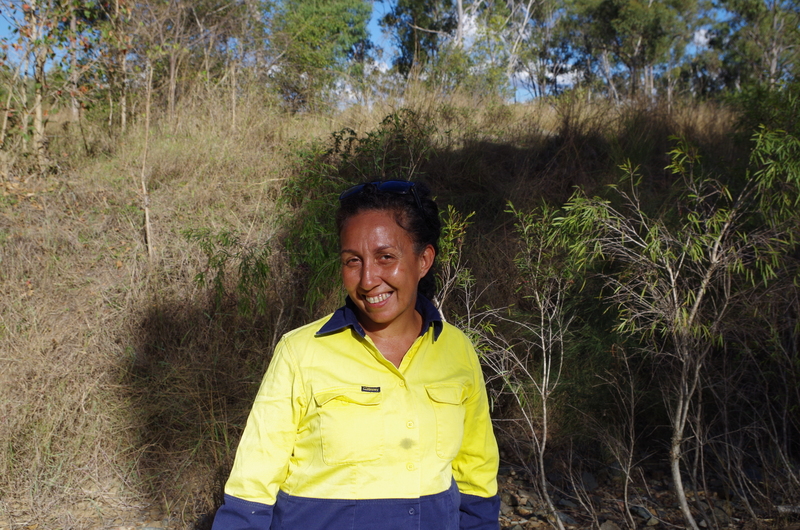 Whilst on survey with Terra Rosa this week, Annie took the time to pay tribute to her mum and grandparents for helping her and others get where they are today. Annie’s Mum Morag, was born in Scotland and immigrated to Gladstone with her family when she was 8 years old. Morag’s mum passed away when Morag was just sixteen and four years later, she had Annie. A year later she married Annie’s dad, Richard and had two more girls while working as a nurse in Gladstone. Annie proudly says that Morag, her hero, “never shied us away from being Aboriginal”. She said that growing up, they were “always around dad’s family” and that it was in fact her mum that “taught me what the word Aboriginal means”. My mum “would say that she was Aboriginal too”, says Annie. Growing up in the 1980s and 1990s, Annie’s “identity gave me confusion”. Since childhood, she always identified as Gooreng Gooreng woman but as she got older, she began to learn more about her identity. She explains how she “experienced racism from her Aboriginal family”. She was regularly asked, “Are you white or are you black”? Fighting back the tears, Annie recounts how hard and hurtful this was and how it “made you feel like you had to choose between your parents”. She immediately highlighted how “Mum never made us feel like we had to choose”. Morag “was the only white person married into the family. She was the go-to person if someone was sick or pregnant”. Annie describes her as firey and caring with a beautiful nature. “She didn’t teach us to hate”, says Annie. Having lost her own mother at a young age, Morag protected young Annie and her siblings from any bad in the world. After her nursing career, Morag, having seen how state aged cared packages didn’t always suit the people of her community, created an aged care package specifically for Aboriginal People. She named this package, Nhulundu Wooeeibah and, under Gehgre Aboriginal Corporation, gave it to the state where it progressed well and developed into the Nhulundu Medical Centre. Annie reiterates how her mum, “a white woman in a black man’s world”, should be acknowledged and recognised for her work on this project. As well as her mum, Annie’s life has been influenced by many strong family women. She describes her Aunty Neola as a vocal advocate and activist during the Land Rights movement of the 1980s. She also talks with pride and a deep respect of her great-grandmother who “guides me, protects me” and who she “feels a very strong presence from all the time”. Annie also talked about her grandfather and how as a young teenager, she was intrigued by him “speaking lingo”. “He had something that I wanted, that I yearned for, that was missing in my life”, says Annie. She wanted him to tell her stories and was upset when he said no. However, as time passed and Annie started to do cultural heritage work, she realised that her grandfather didn’t have to tell her, “it was already there, inside of me and I didn’t know it. Doing cultural heritage work has helped me understand the connection that I have always had”. Annie believes that as the eldest in her family, her ancestors have chosen her to keep her family culture alive and strong. “I’m really passionate about it. It is important for us to reconnect with country and for me – it came in the form of cultural heritage work. It has helped me to be more grounded – I can feel it. I don’t have to question where I come from”. Remembering her mum again, Annie with tears in her eyes, laughs has she talks about her hero, the “migaloo munee (white woman) walking around with three black kids”. Annie and her sons on survey this week with Terra Rosa. Written by Anne-Marie Johnson and TR’s Anne Golden.